The last few days have been delightful. The children returned from their holiday full of stories, and very happy. To listen to them the highlight appears to have been a smorgasbord at a flash hotel in Jakarta, which included a room full of desserts, a chocolate fountain as big as the eldest chick, and sushi that was ‘ruined’ by ‘crazy people who put fish eggs on it – why would they do that?’. I suspect that this only became the highlight as it was the last thing they did before heading home. Judicious cross examination by their mother elicited further details of snorkelling adventures, seeing exotic animals, and watching Balinese dancing. They were so tired on the first night that the boy fell asleep in my arms on the couch – something he hasn’t done for years. We have spent the days since their return preparing for the return to school and the start of the winter terms (shopping trips for underwear, shoes, warm clothes, etc.) I took the three of them to the hairdresser and it was interesting to watch them negotiate with her on their chosen styles. The eldest went for a shorter version of her previous cut (a bob with the fringe grown out) ‘but with more shape to the back’. The artist-in-residence was quite specific about wanting a bob that was longer at the front than the back, and then longer on one side and shorter on the other. 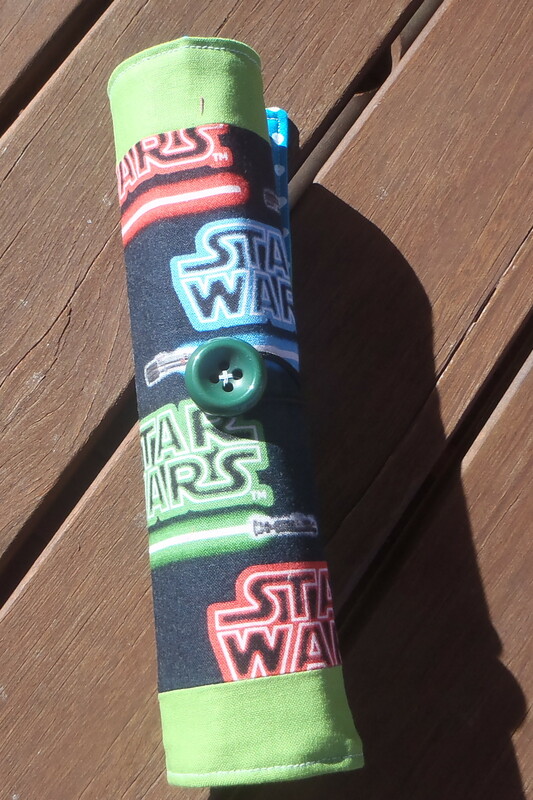 Very chic – especially for 10 and 8 year olds who are surrounded at school by girls with long hair. The boy just wanted ‘something cool’ (i.e. something with product that sticks up a bit!) So interesting to watch their style develop, and their individuality shine through, without any prompting by me. I then had a moment of serendipity. I have been planning for a few weeks to move the eldest chick into her own bedroom. 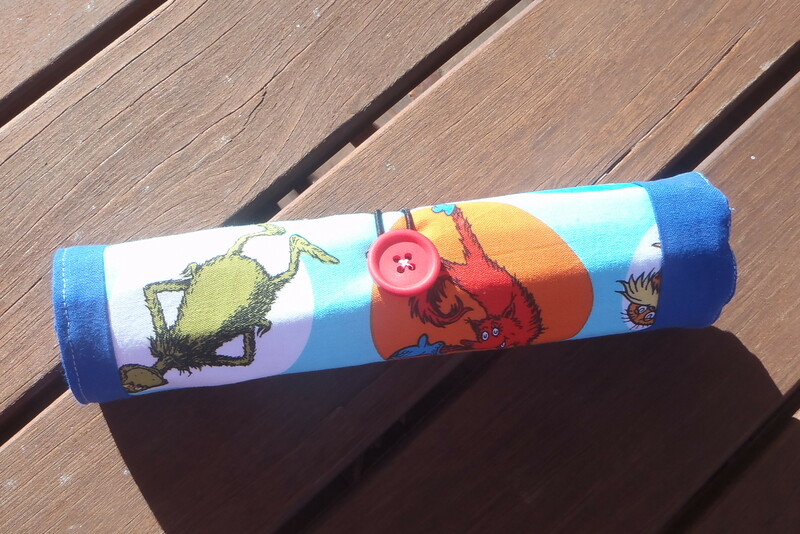 I have also been exploring some better fabric storage and had thought about a chest of drawers for my bedroom – thinking I could decoupage or paint it to fix it up a bit. Then I had changed my mind and was thinking that one of those boring white melamine cupboards would be better for the fabric. I had settled on the bed that I was going to buy for the eldest, and then on some cupboards from the same shop. I borrowed a trailer from a friend to move the queen size bed that was in the spare room back to its owners, with the intention of buying the single bed etc and transporting it home. 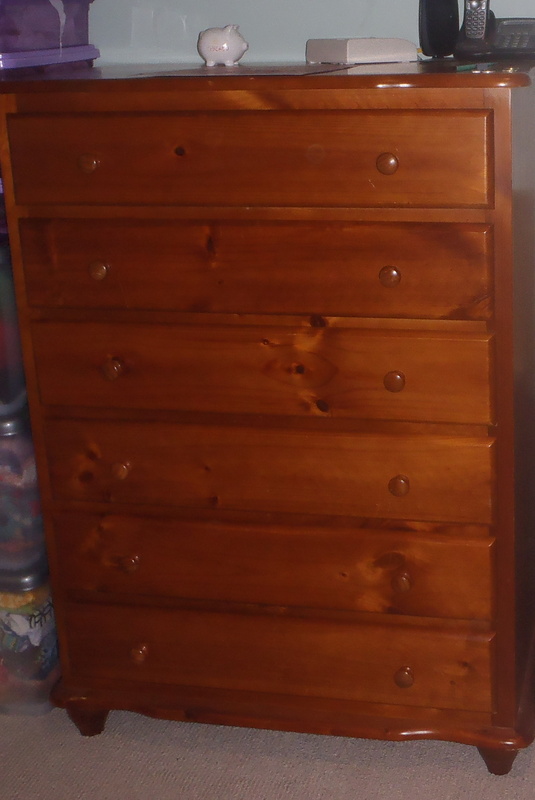 However, just before we started the bed move I checked my email and looked at my emails from ‘freecycle’ and saw someone offering a 6 drawer pine chest of drawers, and a trio bunk – one with a double on the bottom, and a single on top. So my plans changed and I picked up free drawers and a free bed – so now the eldest chick feels very sophisticated having a double (which also gives me more options for accommodating guests now that there isn’t a spare room), the middle chick finally has a desk in her room for her drawing and writing, and I have a lovely piece of furniture, that matches my existing bedroom furniture, to store my fabric in. And no money was spent. The gods were smiling on me! The new bed, midway through the move. Some lessons in bed-making appear to be in order! Of course, this meant that the rest of the weekend has been spent moving, cleaning, sorting, rearranging, and then cleaning again. So we are starting the week, and the school term, all set up in the new arrangement (and almost de-cluttered…..almost). 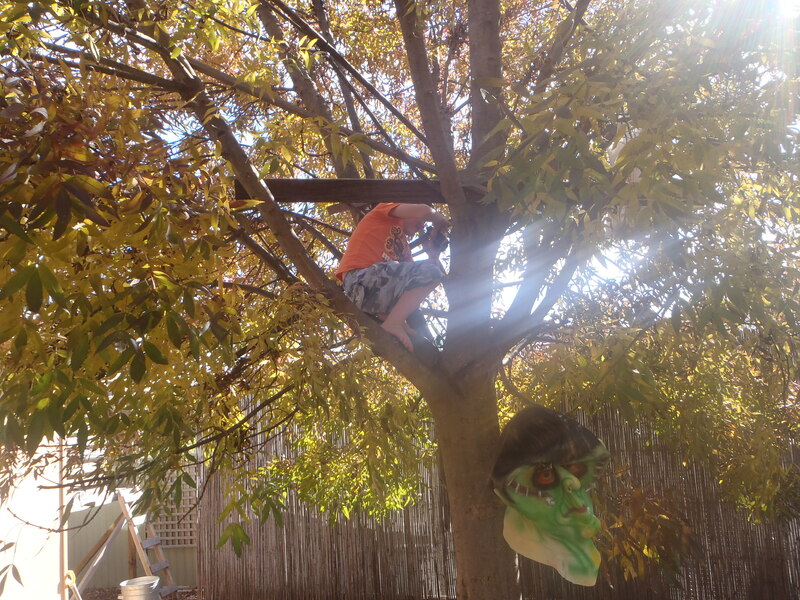 Another delight of the weekend was the boy deciding to build a tree house in the backyard. 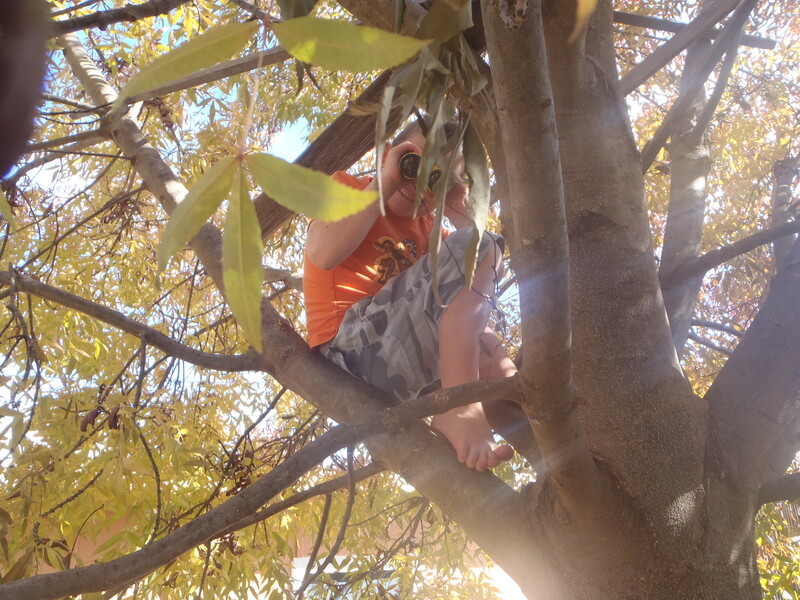 He loves to climb a particular tree that he discovered when his grandmother was visiting. She did that thing that grandmothers do and spent time with him, patiently, which gave him time to find out how to get up, what to do when he was up, etc. Now he shimmies up like a monkey – and has moved various pieces of timber up there, from which he has hung a bag of toys, his binoculars, a torch and his Frankenstein mask (of course!) So much fun to be had with such simple things. It reminded me of my own childhood and the dreams I had while climbing in our peach trees and how many times I hauled bits of wood up, with plans to build a tree house (which – given the size of peach trees, was never going to work!). 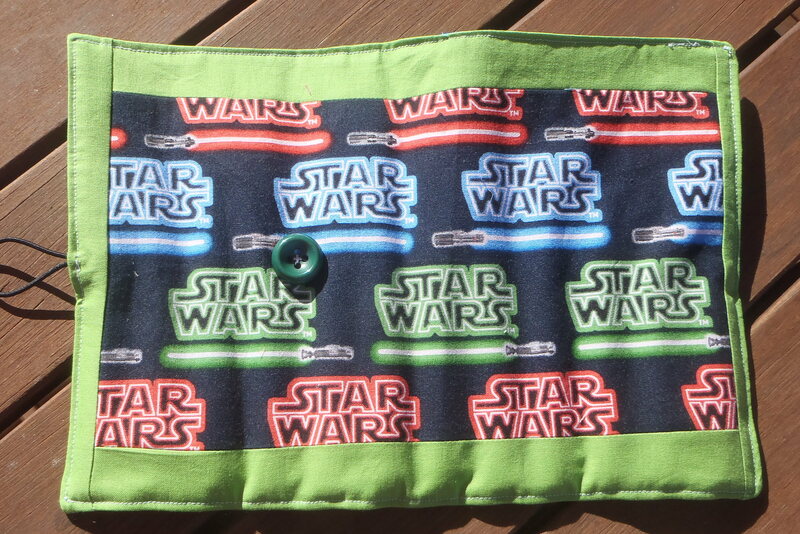 In amongst all of this busy-ness, I managed to sew! 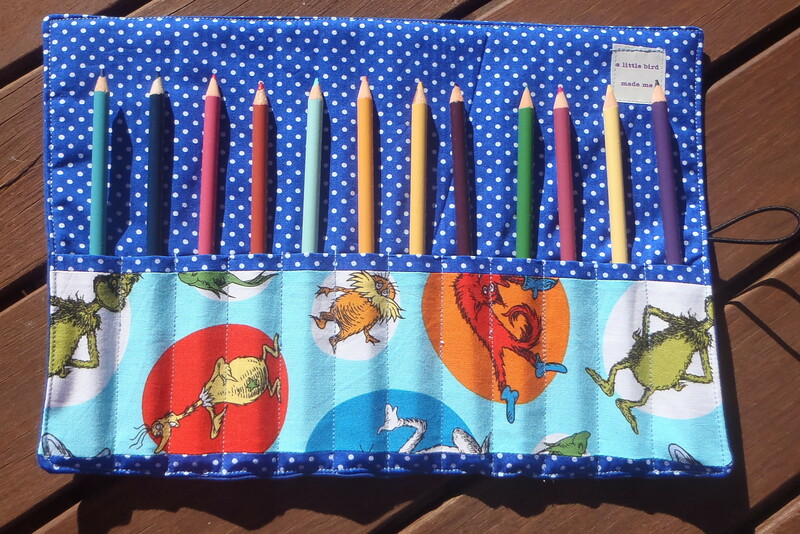 I have been enjoying making more pencil rolls – 10 so far this week, with more to come. I haven’t managed to list any in my Etsy shop yet – they are all spoken for already. So my aim is to make more this week, and to list some in the shop. 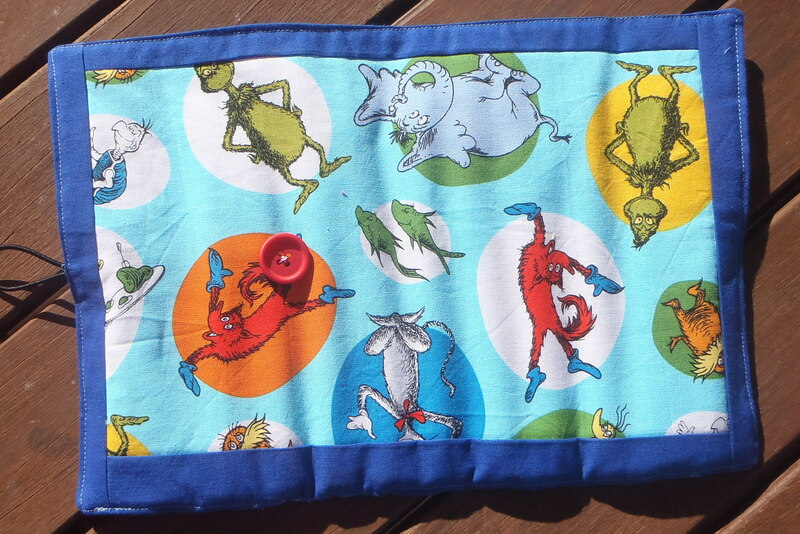 I also wanted to make something for my niece who has a birthday in the next couple of weeks. She is turning 9 and is beyond ‘toys’, and has enough gadgets. 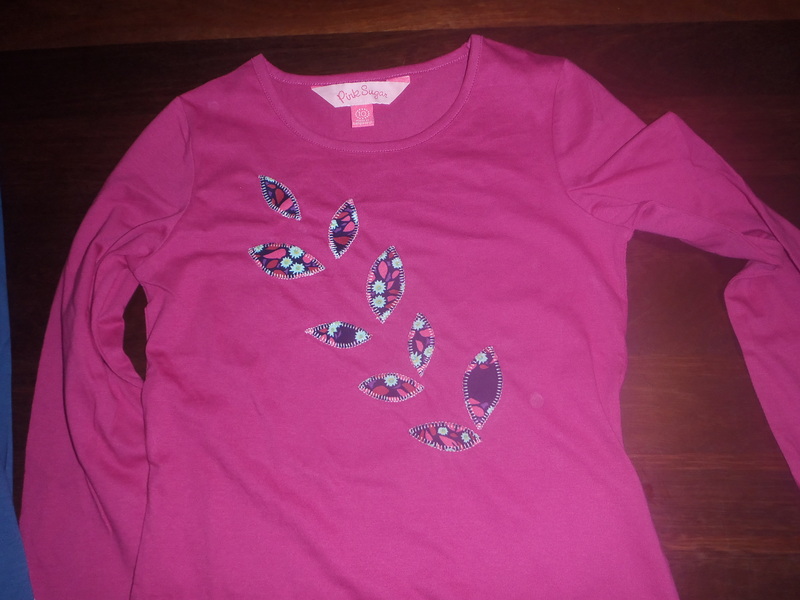 So I decided to appliqué two tops for her. I am quite happy with the way they have turned out. 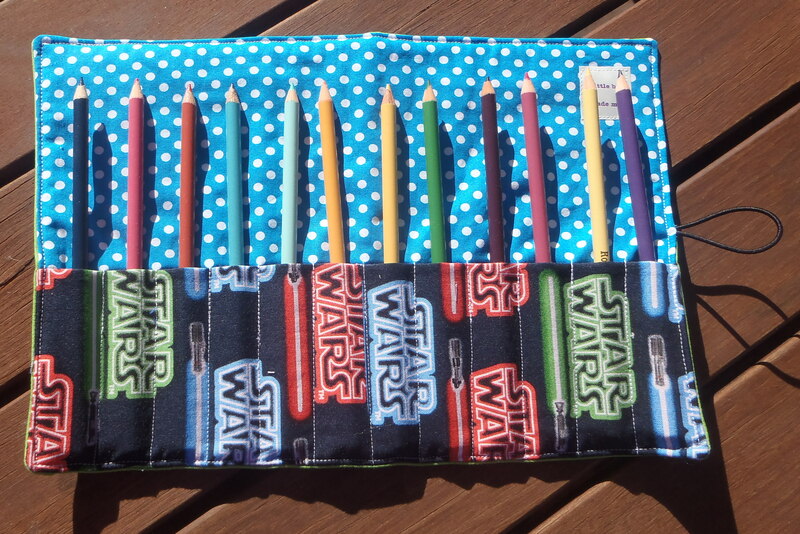 Combined with a pencil roll (because I really am enjoying the perfect blend of fabric and function) her present will be in the mail in the next day or so, to (hopefully) arrive in time for her birthday. The other delight of the weekend was that realisation that as the children get older, I don’t have to do everything on my own. The girls helped to carry the pieces of the new bed, the chest of drawers and mattress inside from the trailer. 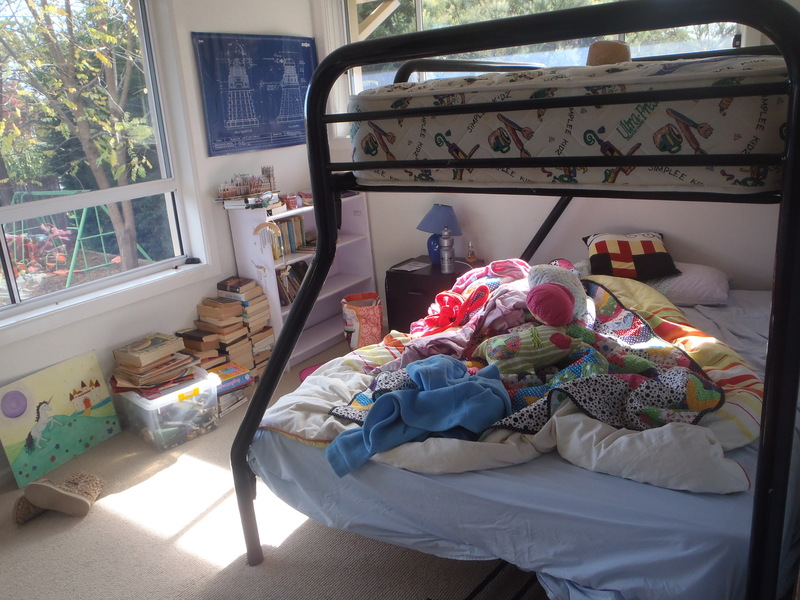 The middle chick helped me to dismantle and remove the loft bed that had formed bunks in her room. The boy washed the very dirty car, and the eldest chick did the baking for their school morning teas for the week. The boy sorted through his dress up box and made a pile of the costumes he wants to give away, and the girls both (after some nagging by their mother) sorted through their bookshelves and buckets of toys and identified what they are ready to give away. The end of this little bird having to do it all might actually be in sight! Of course, as I have been writing this post, the middle chick, and artist-in-residence, has announced that she has chosen her costume for this year’s Book Week parade (normally some time in August) and that we need to buy some silk fabric to make it, and it will be a nice dress that she can wear when it isn’t a costume. While tucking her into bed I found her plans for the costume on her desk. Guess there is more work for this little bird yet! I hope that you have had a lovely weekend, wherever you are, and that the week ahead holds joy for you. 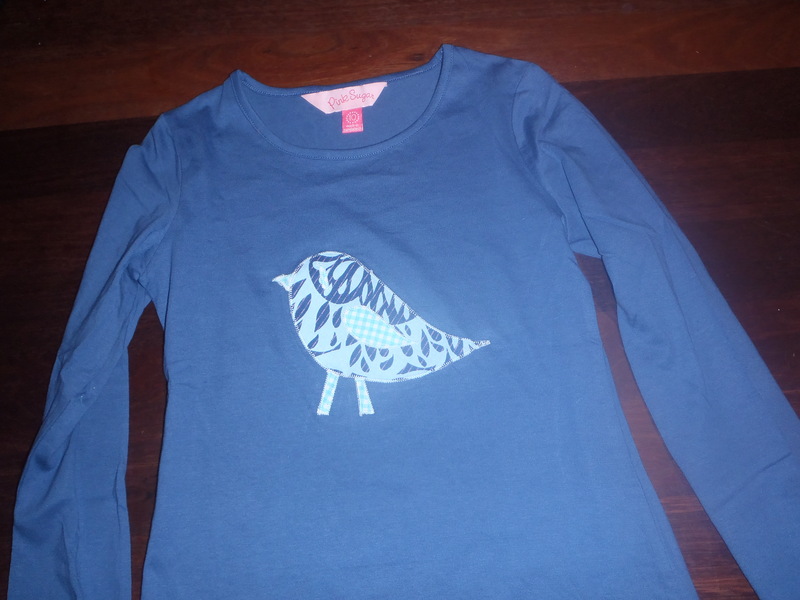 This entry was posted in Uncategorized and tagged applique, children, family, freecycle, pencil rolls, serendipity, Sewing, style, treehouse on April 28, 2013 by a little bird made me. Thanks! I had a look at your blog, and can say that I enjoyed too! 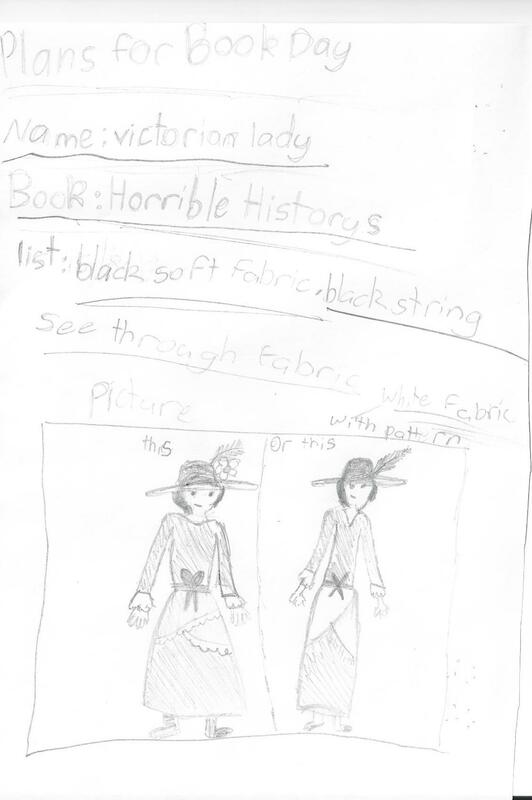 Great costume idea from your daughter, you’d have a lot of scope for fun making a Victorian dress. I look forward to seeing what you come up with. Thank you! She has been researching fabrics online tonight, so I can see that this is not a whim. Luckily I think I have a few months – but then I often run out of time by thinking that way, so better plan a bit more this time! It has been – thanks! So beautiful to read. I am so pleased the boy is enjoying the tree. The Victorian girl’s design is very special. Thank you! You have given him great joy with his tree climbing. I thought you would appreciate the costume design too! I am amused that she thinks silk is required. The detail on the drawing includes a need for ‘see through material’…….. I am going to suggest muslin as being most Victorian, rather than silk!